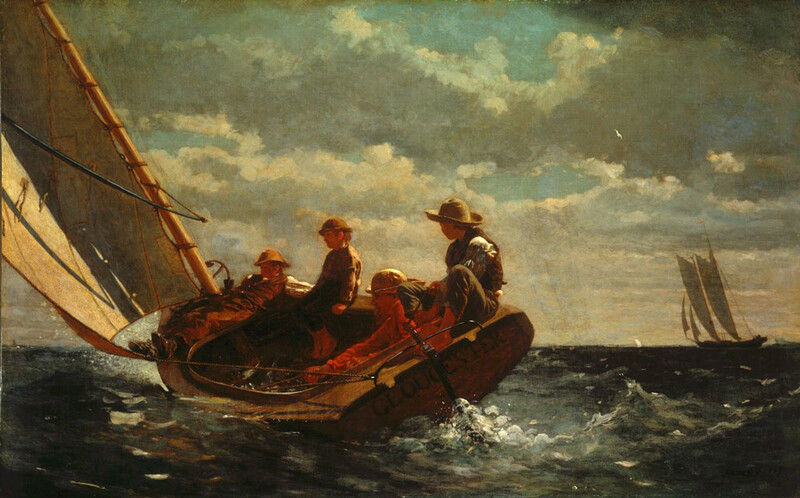 Breezing Up (A Fair Wind) was the original title of the oil painting of Winslow Homer, painted from 1873-1876. Homer began this painting from a watercolor sketch he had done, when visiting in Gloucester, Massachusetts. Choosing the sketch which most resembled the outcome he desired, he re-painted the sketch in oils, changing the composition somewhat, and was inspired to redesign the watercolor sketch by the scenes of the Massachusetts coast. Today, it is considered Homer’s finest iconic, American painting, and is housed at the National Gallery of Art, in Washington D.C. Depicting life on a breezy day on the coastal waters, the painting is rich in color, shadowing, and detail. Its Japanese influence is shown by the compositional balance Homer used, with the left half being more active, and very little focal content on the right. A man and three boys are shown, enjoying the waves of the ocean, on their catboat, the Gloucester. The boat has one sail, and the boy manning the till is so relaxed, that he is managing to steer with one hand. The oil painting differs from Homer’s previous watercolor in that he removed a fourth boy, and a second schooner off in the distance to the right. The relaxed atmosphere makes it evident that the white-crested waves are not a bother to any of the boaters, who are just enjoying life on the water. The anchor in the bow of the boat, which replaced the fourth boy, represents hope, and the way in which the boaters are looking off toward the horizon, is symbolic for optimism, or great expectations for the future. This painting was completed in America’s centennial year of 1876, and captured the look, spirit, and hope of American life. It was a favorite at the National Academy of Design, and then at the Centennial Exposition in Philadelphia. So many critics were speaking of the painting that the name was shortened to “Breezing Up.” It is a fresh, energetic, compelling, and beautiful work of art, displaying the hope for America, and the optimism which flourishes within the everyday lives of people in this country. I have a very old print that is very similar to this except that the picture is shot from the starboard side, has three boys, and appears to depict the sailors in heavy seas and in some trouble. I cant find any reference to it anywhere. Can anyone identify the origin?